In 1960, the combined oral contraceptive pill was first approved for use in the United States. Seven years later, “the Pill” was featured on the cover of Time Magazine, illustrating its enormous societal impact. Roughly two generations later, statistics from the United Nations show that, within more developed nations worldwide, just under 16% of “partnered” women use contraceptive pills, a number which does not include usage among single women. However, even as the popularity of oral contraceptives remains high, the drugs themselves have been evolving in response to further discoveries about the human reproductive system, as well as efforts to reduce the Pill’s negative side effects. As with any major technological or medical development, particularly one embraced very quickly by a large sector of the population, it can take years, and even decades, for the full range of effects to become evident. And as demonstrated by several recent studies, many questions remain unanswered regarding the long-term and environmental effects of the hormones used in oral contraceptives, as well as other medical treatments. When a new synthetic substance is created, or a naturally occurring substance is generated at greatly increased levels, the effects can be far longer-lasting and wider-reaching than its manufacturers predict or intend. Some well-known examples of this include asbestos, a popular insulation and flame retardant in the late 19th century, which was later discovered to be carcinogenic; and polystyrene foams like Styrofoam, which is frequently used in disposable packaging, yet takes hundreds of years to break down once discarded. In the case of oral contraceptives, the key ingredients are synthetic hormones known as progestins, which mimic progesterone, either alone or combined with estrogen. When used therapeutically in contraceptive pills or in hormone replacement treatments for menopause, these synthetic hormones make their way into the water supply after being excreted in the patients’ urine. As environmental contaminants, these are referred to as endocrine-disrupting chemicals (EDCs), due to the fact that they interfere with the endocrine systems of humans and animals alike following exposure. 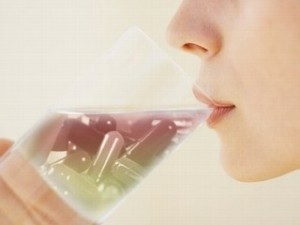 While its impact is still being widely studied, there is no doubt that the exposure is occurring: multiple international studies have documented elevated levels of natural and synthetic hormones in drinking water, and one such study conducted in France noted that progestins in particular were more resistant to removal by water treatment methods, compared with other types of pharmaceuticals . Due to the accumulation of synthetic steroids in water, much of the research conducted on its impact has been done using water-dwelling vertebrates such as fish and frogs. An ever-increasing collection of studies report harmful effects of these hormones on aquatic vertebrates, particularly with regard to their reproduction, as would be predicted given the nature of the contaminants . One study focused on the effects of exposure to the progestin Levonorgestrel (LNG) on the frog Xenopus tropicalis. While the male reproductive system did not appear to be impaired, female tadpoles exhibited severe defects in the development of their ovaries and oviducts, rendering them sterile . While studies such as these cannot be taken as a direct assessment of the impact of environmental EDCs on humans, they do have certain advantages: the capability of controlling for the duration and concentration of exposure, and the fact that these animals’ life cycles are much shorter than those of humans, thus enabling multigenerational studies in far less time. Like the proverbial “canary in the coal mine,” animal studies can serve as early indicators of environmental conditions that may prove harmful to humans and direct our attention toward seemingly innocuous substances we encounter in the air we breathe, the food we eat, and, as in this case, our water supply. However, the effects of EDCs are not limited to water-dwelling frogs: female sterility resulting from early exposure to progestins has been reported in studies involving rats and mice, whose mammalian reproductive systems more closely resemble those of humans . The female reproductive system undergoes many key developmental changes in the early stages of life, and these changes are dependent on endocrine signaling events that are sensitive to contaminating environmental hormone exposure. A series of studies by a group at the National Institutes of Health (NIH) have demonstrated that mice exposed to phytoestrogens – plant estrogens such as those found in soy products – at key developmental time points exhibited impaired fertility . In contrast to mice, in which the critical period of time is during the neonatal period, the human female reproductive tract is undergoing development from prior to birth through adolescence. Therefore, it is necessary to evaluate the risk of exposure to EDCs across a broader window of time, beginning in the womb. The use of hormonal contraceptives by pregnant women is discouraged for the obvious reason that they are not ovulating, in addition to the potential for harm to the unborn child. However, postpartum contraception guidelines issued by the Centers for Disease Control in 2011 state that the use of progestin-only contraceptives “can be initiated immediately postpartum,” and discourage the use of estrogen-containing combined contraceptives in breastfeeding women primarily because the estrogen can reduce the mother’s milk supply . The presence of progestins in the breast milk of women taking oral contraceptives has not been demonstrated to adversely affect their babies’ health, although such assessments tend to focus on the short-term outcomes rather than those that might not manifest until adulthood. Nevertheless, the most recent report from the NIH group studying the effects of phytoestrogens highlights the notion that limiting early exposure to plant estrogens, such as those found in soy-based infant formulas, may prove to be beneficial to female reproductive health in the long term. Furthermore, the potential harms of prevalent EDC pollution in the environment are not restricted to women: in November of last year, the British Medical Journal published a report indicating that levels of prostate cancer in men are highest in geographic areas with the greatest use of oral contraceptives . While the authors stress that their findings are correlative rather than causative, their work provides a sobering hypothesis for further important research. Ultimately, the Catholic opposition to contraception is grounded in a fundamental understanding of the meaning of human life and the purpose of procreation as a part of God’s plan, not a pragmatic conclusion reached by painstaking scientific research. While it makes intuitive sense that humans both individually and as societies benefit by living in accordance with the wishes of their Creator, in a fallen world there are practical things that can be done to alleviate some of our suffering, including the use of medical technology and pharmacology. It should be noted that synthetic hormones are not exclusively used in contraceptives, nor are the chemical compounds marketed as contraceptives intrinsically immoral – for instance, an unmarried and abstinent woman using hormonal treatments to treat endometriosis in the hopes of safeguarding her future fertility is doing nothing sinful, regardless of the efficacy or side effects of her decision. However, in a world in which influential groups and individuals are increasingly advocating for population control, often in a manner that recalls the eugenics movement of decades past, it is necessary to insist that research be done to uncover truths regarding the long-term and unintended side effects of widespread contraceptive pill usage. This article originally appeared on Zenit.org and is reprinted with permission. (6) Uzumcu M, Zachow R. Developmental Exposure to Environmental Endocrine Disruptors: Consequences within the Ovary and on Female Reproductive Function. Reproductive Toxicology. 2007; 23(3): 337–352. (8) Update to CDC’s U.S. Medical Eligibility Criteria for Contraceptive Use, 2010: Revised Recommendations for the Use of Contraceptive Methods During the Postpartum Period. CDC, July 8, 2011.